Puella Magi Madoka Magica Volume 1 is the first of three volumes planned and contains the first four episodes of what may be one of the most popular anime series of 2011. The anime took off by storm and achieved quite the critical acclaim and fan following. Puella Magi Madoka Magica did so well that it even anime hipsters called it ‘overrated’. Considering that Puella Magi Madoka Magica falls under the ‘Magical Girl’ sub-genre, its impressive mainstream success in not just Japan but all over the world, certainly comes as a surprise. 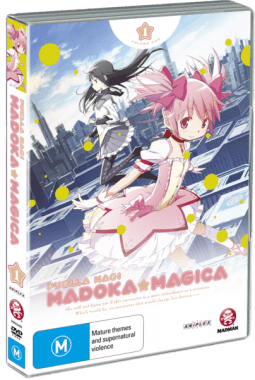 Puella Magi Madoka Magica may at first seem like a product of the Japanese Moe culture, a niche series made for a very specific audience. However, Volume 1 proves that this show is far more than what it seems as within the four episodes you will find a deep and mature show with really good characterisation. By the time you’re done with this volume, it becomes clear that this show has a demeanor unlike the anime subculture/subgenre to which it belongs. Also worth noting at this point that the DVD does not have any extras apart from the customary trailers and opening/ending themes. Madoka Magica tells the story of a 14 year old girl named Madoka Kaname, who lives a happy and peaceful life and is surrounded by great friends and a loving family. 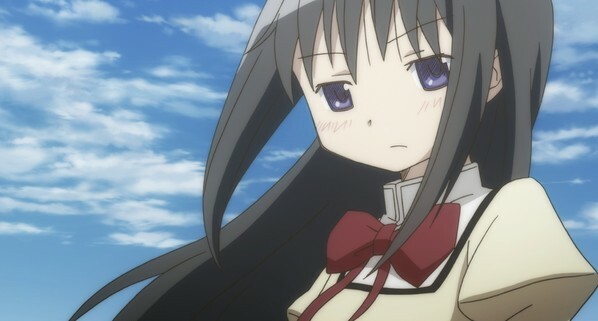 This all suddenly changes when a mysterious new student named Homura Akemi joins her class, who Madoka Kaname saw in her dreams before even meeting her. Little did Madoka know that she and her close friends were about to get involved with some great powers and get themselves into an interesting predicament. 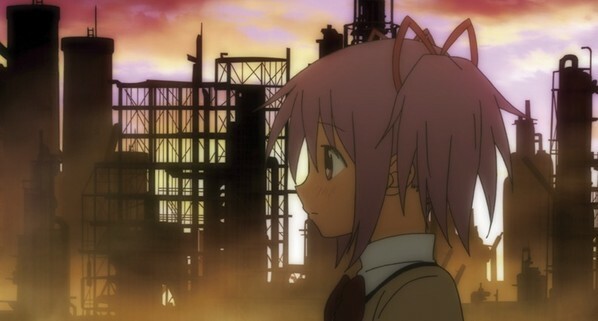 Early on Madoka has an encounter with a strange magical creature called Kyubey, completely out of the blue in an attempt to save it from danger. This creature turns out to be a powerful entity can grant one wish to her, and that wish can be absolutely anything she desires. However, in exchange for that wish, Madoka must become a Magical Girl for life. A Magical Girl is a supernatural warrior with great powers, charged with the duty to battle Witches that threaten the local populace. Puella Magi Madoka Magica starts off innocently enough, as it all seems to be happy and cute in its characterisation, humour, and themes. Madoka Kaname seems to have the perfect life and even her magical encounter with Kyubey seems pretty innocent too as the creature itself is your typical adorable critter. The characters seem to have the typical anime school girl lifestyle filled with tea parties, obsession with deserts, and even talking about boys. If anything it initially gives off the impression of being a supernatural slice of life series. However, nothing is what it seems as within the first four episodes the show takes an unexpected U-turn and shows its true colours. Puella Magi Madoka Magica isn’t what I described in the previous paragraph as the show is in fact far more compelling than the initial vibe it gives off. Luckily you’ll realise by the third episode in this volume that this is a serious show that really deserves the praise and fame it achieved in 2011. I won’t get into the details of what unfolds but all I can really say is that it really switches gears into something really special, nothing is what it seems and even the characters have more to them than their innocent and adorable demeanor, including the supposedly loveable plush-toy-like creature Kyubey. This is a seriously action packed drama, one that explores mature themes and has really deep and compelling characterisation. It becomes clear that the appeal of the show is not just for the niche audience of the subculture that it apparently draws upon, as instead it’s pretty much geared towards any fan of anime who’s looking for a nicely paced show with a mature story and an interesting cast of characters. 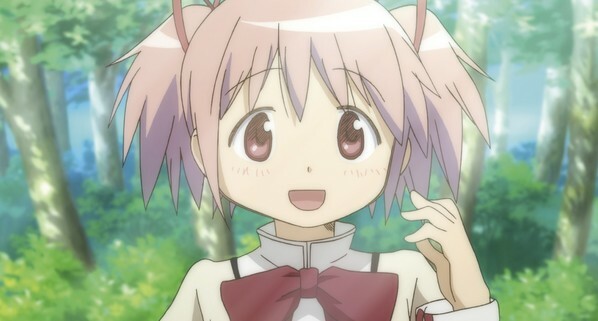 Puella Magi Madoka Magica’s art style and ambience initially gives off cheery vibe similar to shows like Lucky Star. The character designs have an air of innocence to them as they’re all very colourful with the typical anime conventions to make them appear as cute as possible, as is the case with these kinds of shows that focus on adolescent girls. Madoka’s design pretty much sums it up, as she sports a pink hairdo. However there is some mature artistic flair here, in particular the scenes where the characters venture into what’s known as the Witch’s Labyrinth. These areas are illustrated and expressed in a rather abstract and surreal manner, almost like walking inside a Picasso painting. The art direction in those scenes is rather creepy and dark, and drops the typical anime style look for something really unorthodox and unique. 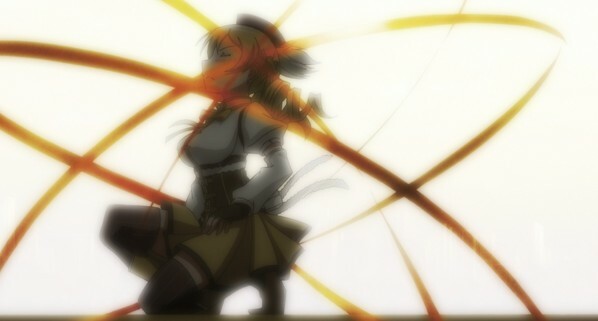 Visually, these scenes represent some of the best moments of the anime. In terms of audio, Puella Magi Madoka Magica has a nice soundtrack, initially the style of music compliments the apparent happy go lucky nature of the premise and setting, but as soon as things pick up the soundtrack also evolves into something far more epic and dramatic. The English dub is actually pretty decent here with no one sounding particularly cringe-worthy, the English voice cast do a decent job in portraying the essence of the characters, and convey the appropriate level of emotion in a given scene. Puella Magi Madoka Magica in short, is a pleasant surprise. Those who initially dismissed it as a shallow byproduct of the anime Moe subculture, they will surely be caught off-guard as the show is more than what it appears to be. Even within the first four episodes, Puella Magi Madoka Magica gives off a lasting and positive impression, and will leave you wanting more. By the time you finish Volume 1, you will definitely be looking forward to the eventual release of Volume 2 and Volume 3, as this is one show you definitely want to see through till the end. Do not be fooled by the pink and childish looking cover art, this anime is serious business, one that starts off with an impactful bang.